Scott Kerwin has one last item to fulfill on his dirt track driving career bucket list before Ransomville’s DIRT.car 358 Modified season draws to a close at summer’s end. He very much desires to capture the Ransomville 358 Modified season point championship. 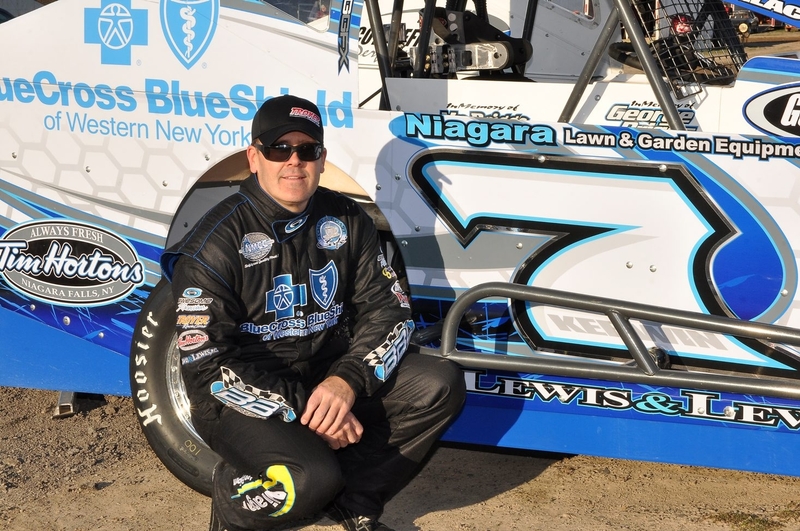 Kerwin, 51, drives the Briggs Bros. Lehr Racing (BBL) 2015 Troyer 358 Modified entry, and the Newfane-based driver has won championships in each Ransomville division in which he has competed – with one notable exception. Kerwin never has worn the crown in Ransomville’s headlining 358 Modified class. His six Ransomville titles consist of one apiece in the Bomber and Pro Stock classes as well as four in the DIRT.car Sportsman division. Kerwin launched his long racing career at Ransomville in the old Bomber class in 1984 and captured a season championship in 1987. He remained in the class through 1988 and received much advice during those years from fellow Bomber drivers Jim Skutt and Bob Snyder. In 1989, Kerwin ventured into the Sportsman and emerged with the division’s rookie-of-the-year honors. He also won in the Sportsman class when he captured a checkered flag at the Rolling Wheels Raceway Park in Elbridge. Kerwin earned three straight Ransomville Sportsman season point titles beginning in 1990. He added another in 2005. In 1993, Kerwin left the Sportsman class to move up to the 358 Modifieds in his self-owned machine that utilized an engine provided by Pete Cocco and Ed Briggs. He remained in the class through 1996 and then took a self-imposed hiatus from his career in 1997 to build a family home with wife, Kris and await the birth of the couple’s eldest daughter, Jamie. His time on the sidelines extended into the 2000 season. The couple also has a second daughter, Erin. Kerwin decided to resume racing in 2001 at Ransomville in the Pro-Stock Division at the urging of friend and fellow racer Dave Stolzenberg. In 2002, Kerwin enjoyed what arguably has been his finest year in racing while driving for owner Johnny Cocco. The team won Ransomville’s 2002 Pro Stock championship and enjoyed 12 victories that season spread over competition stops at Ransomville, Merrittville, Little Valley and Humberstone. They also captured a prestigious Pro Stock special at The Dirt Track at Charlotte Motor Speedway. Still more career moves were in store as Kerwin returned to the Sportsman ranks in 2003 through 2006, racing for owners Roy Dean, Pete Cocco and the late Mark Cerrone. In 2007, Kerwin made the move once again to the 358 Modifieds, where he has been ever since. Since 2010, Kerwin has driven for BBL Racing and owners Sam Lehr, and Ed and Jimmy Briggs. The current pit crew consists of Mike and Aidan Seefeldt, Dave Wood, T.J. Mandhardt, and Pete and Johnny Cocco. Sponsorship is provided by Blue Cross Blue Shield of Western New York, Crown Benefits, Niagara Lawn and Garden Equipment, National Maintenance, Tim Hortons of Niagara Falls and Lewis & Lewis. Kerwin’s mom, Gayle, provides much moral support. Kerwin has no timetable to complete his quest. “I expect to race as least a couple of more years because I’m still having fun,” he said. “If it stops being fun, then I will quit, but I don’t see that happening anytime soon. • Merrittville Speedway opened its season last Saturday night with Mat Williamson (DIRT.car 358 Modified), Gary Lindberg (DIRT.car Sportsman) and Jason Barney (Patriot Sprint Tour) posting wins. • Northeast racing legend Davey Moore, known as the “Canadian Blast,” returned to driving at Merrittville for the first time Saturday since 1999. He drove a 358 Modified entry fielded by Jeff Jepson. Moore placed 15th in the 20-car 35-lap race. • Super DIRT.car Modified Series star Billy Dunn of Watertown is racing weekly in the 358 Modified class at Merrittville this season in the Randy Slack-owned car that is sporting an experimental 327 cubic inch spec engine provided by Wegner Automotive Research. Racing competitively at a cheaper price is the team’s goal. • Dunn won the Syracuse 200 at the New York State Fairgrounds in Syracuse two years ago. The event is considered the most prestigious event in DIRT.car Modified racing. This October’s race appears it may well be the last at the state fairgrounds large one-mile dirt oval due to redevelopment that will eliminate the grandstand and track.